You may remember seeing some of Sandra's lovely work before. (Sandra is from Yorkshire, UK.) 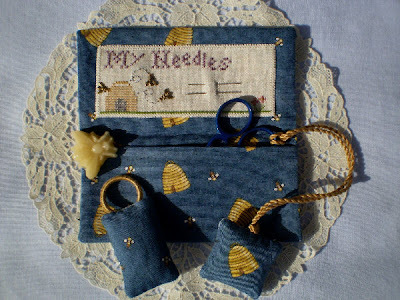 Today I have photos of her Busy Bee Sewing Case. 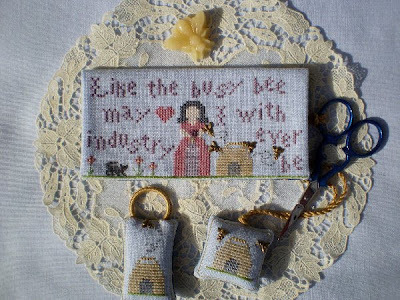 Sandra wrote, Seeing Su's "Busy Bee Sewing Case" reminded me that I have finished one or two of your projects, although this was stitched years ago. I would have used DMC threads as this was in the days before I was buying overdyed threads, or silks etc. I made a little thread holder to go with case and scissor fob. I believe the lining fabric came with the chart pack together with the bees. Thanks, Sandra, for sharing more of your wonderful work. I really like the additions you've made to this project, and the bee waxer is wonderful!! 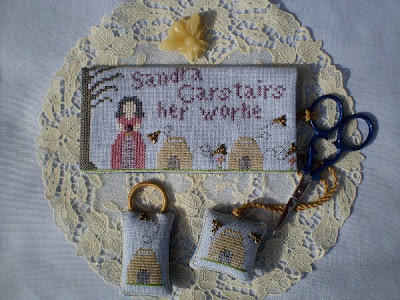 Sandra told me that she has recently finished her Acorn Sampler Sewing Case and hopes to send photos soon. Sandra is an awesome stitcher and finisher. She definitely did your kit justice. Thanks, Paula. This is an early one so it doesn't have the sophistication of the later ones. On the plus side, the chart contains the darling bee fabric! I cringe when I look too closely ay my older pieces, and feel sure that my stitching has improved over the years. Thanks for showing this Ellen, will send more pics soon. Sandra cringes??? she is such an accomplished stitcher, beautiful finishes and al the older pieces will be a reminder how it all started, don't you think Ellen?.